62 records – page 1 of 2. Folder contains a report on the development "UniverCity" on Burnaby Mountain. This portion of the interview is about Mary Lumby talking about her move to UniverCity in 2007, why she likes living there and some of the disadvantages. She talks about the challenges of creating a sense of community in UniverCity, comparing it to the active involvement of Forest Hills and Forest Grove residents in civic affairs, and about problems of isolation on the mountain top, and separation between campus and the residential area. This portion of the interview is about Dr. Evenden and Dr. Seager’s description of proposed ideas for improving access to SFU’s campus on Burnaby Mountain, stories about weather related events on the mountain, and whether UniverCity will solve the problem of SFU’s isolation. Dr. Evenden mentions the ideas of Dennis Roberts and Peter Knowlden. This portion of the interview is about Lee Rankin talking about the Simon Fraser Liaison Committee’s activities after 1996 and land use at UniverCity. He talks about the challenge that SFU faces as a land developer and the City’s response to UniverCity residents’ demands for services. He tells a story about his time as a SFU student and the proposed ice rink on campus. This portion of the interview is about Reidun Seim talking about what the Burnaby Mountain Conservation Area means to her, and how green space benefits people, especially giving them the freedom and safety she remembers from her childhood. She talks about her concern about the construction of UniverCity and its impact on erosion and water drainage from the mountain. She tells a story about flooding from overflowing ditches on Curtis Street in the 1970s. Recording is of an interview with Reidun Seim conducted by Kathy Bossort. Reidun Seim was one of 23 participants interviewed as part of the Community Heritage Commission’s Burnaby Mountain Oral History Project. The interview is mainly about Reidun Seim’s memories about her parent’s farm on Curtis Street, events in her childhood, and the people who lived in or visited her neighborhood. She takes us on a tour of her neighborhood in the 1940s, telling us stories about families who lived on Curtis Street on and east of 7300 block, including people who lived on Burnaby Mountain in the old Hastings Grove subdivision above the end of municipal water service at Philips Avenue. She describes changes to Curtis Street, particularly after it provided access to Simon Fraser University in 1965. She also talks about her teaching career, and about how she values the green space and conservation area on Burnaby Mountain. Reidun Seim was born in 1931 in Vancouver B.C. to Sjur and Martine Seim. Sjur and Martine Seim emigrated to Canada from Norway in 1930, and after settling in Vancouver, moved to an acre of land and a new home at the base of Burnaby Mountain in 1932. Sjur attended UBC to learn about poultry farming and began his own chicken and egg business in 1935. The farm animals and large garden also contributed to the family’s livelihood and self-sufficiency. The Curtis Street neighborhood was a lively place and extended well up Curtis Street on the west slope of Burnaby Mountain, where Reidun would babysit for families. Reidun attended Sperling Avenue Elementary School (Gr. 1-8), Burnaby North High School, and Vancouver Normal School for teacher training in 1950-1951. She began teaching primary grades in Port Coquitlam at James Park School. Most of her career was spent in North Delta, teaching at Kennedy and Annieville schools from 1954-1958, appointed Primary Consultant (1958-1960) and Primary Supervisor (1960-1985), before retiring in 1986. Reidun lived at home with her parents on Curtis Street, commuting to Delta, and continues to live in the original farmhouse. This portion of the interview is about Barry Jones’ talking about UniverCity, the future of the forest on Burnaby Mountain, and the positive uses people make of the parkland. He also talks about the need to improve the entrance to the Pavilion area on the mountain, and suggests that Canada’s 150th Centennial in 2017 would be a good opportunity for doing so. Recording is of an interview with Barry Jones conducted by Kathy Bossort. Barry Jones was one of 23 participants interviewed as part of the Community Heritage Commission’s Burnaby Mountain Oral History Project. The interview is mainly about Barry Jones talking about his home and the conservation area on Burnaby Mountain, and about the negotiations that resulted in the agreement between Simon Fraser University and the City of Burnaby in 1995. He talks about the building of Burnaby Mountain Parkway and its link to the 1995 agreement, and about his experiences with Trans Mountain tank farm and pipeline. He also talks about his education and career as teacher, school board trustee and politician. Barry Jones was born 1940 in Princeton, BC. His father moved the family to a home on Georgia Street in North Burnaby in 1944 where Barry grew up. He attended UBC majoring in mathematics and chemistry, and unable to find work in his field, taught two years in northern BC. He liked teaching and returned to school, enrolling in education at the newly opened Simon Fraser University in 1965. He taught one year at Moscrop Secondary School in Burnaby and finished his 25 year teaching career in Coquitlam. Barry served ten years as a Burnaby School board trustee, and then ten years as North Burnaby MLA (NDP) beginning in 1986, serving five years in Official Opposition and five years in government under then-premier Mike Harcourt. During his time in government, Barry Jones successfully lobbied for freedom of information legislation. He also played a role in resolving the dispute between SFU and Burnaby over control and ownership of land on Burnaby Mountain and in creating the Burnaby Mountain Conservation Area in 1995. He continues to live on Burnaby Mountain in a home he bought in 1971. This portion of the interview is about Mary Lumby talking about her involvement in environmental groups and events in Burnaby, in particular her membership on Burnaby’s Environment Committee as a citizen representative, and her coordination of 1992 Ecofestival events held in Burnaby’s Centennial. She also talks about the Burnaby Mountain Preservation Society, environmental issues for Burnaby Mountain, and the land stewardship shown by SFU and the City. Burnaby Mountain had been dedicated as park in 1942, however the original park boundaries were reconsidered in 1952 with the development of the Trans Mountain Pipeline. Although the boundaries were adjusted to accommodate this project, significant conservation and park lands were left untouched. 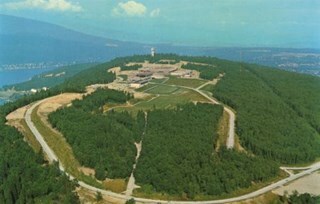 When, in 1962, the government of British Columbia determined the need for additional post-secondary facilities, Burnaby Mountain was chosen as the site for the new Simon Fraser University which opened in 1965. As early as 1964, the idea of establishing a townsite around the university had been discussed by Burnaby, but it was not until the mid-1990s that the idea came to fruition and by the early 2000s, a new housing development know as the UniverCity took shape on the mountain adjacent to the university. This portion of the interview is about Dr. Evenden and Dr. Seager’s description of the relationship of SFU’s faculty and administration to Burnaby Mountain’s environment, including stewardship of the land, academic research related to the mountain, and the development of UniverCity. Dr. Evenden talks about Dr. Colin Crampton’s writings about the natural history of Burnaby Mountain, and Dr. Seager references the controversy over the target ranges on the mountain and Dr. Stephen Collis’ work, as examples of faculty involvement in local environmental issues. This portion of the interview is about Mayor Corrigan talking about the City’s awareness by about 1990 for the need to do something to ensure the long range protection of the conservation area on Burnaby Mountain. He talks about the role Council, the Burnaby/Simon Fraser Liaison Committee, the Province and Mike Harcourt’s government, Burnaby Mountain Preservation Society, all contributed to finding a win/win solution for the City and the university. This portion of the interview is about Mary Lumby talking about her career as a teacher in Burnaby at Douglas Road, Suncrest and Stride schools, and her move to the Parkcrest neighborhood in Burnaby in 1977 and in 1983 to Forest Hills. She talks about visiting Burnaby Mountain Park and the Owl & Oarsman restaurant, and the history of the development of Forest Hills in the 1980s. This portion of the interview is about Mary Lumby talking about living in the Forest Hills community, the location of the Burnaby Mountain Urban Trail in Forest Hills, and the Forest Grove community and school. She explains why parents were hesitant to let children play in the conservation area unsupervised. She tells a story about her children selling pop to the golfers on the Burnaby Mountain Golf Course. This portion of the interview is about Mary Lumby talking about the Trans Mountain tank farm and its good relationship with neighbouring communities when she lived in Forest Hills, and how that relationship has deteriorated. She also talks about the lack of engagement between communities with Simon Fraser University and how that has improved. This portion of the interview is about Mary Lumby talking about the meaning of conservation and the traditional landmark character of the mountain. She also talks about approaches to managing the conservation area, the impact of people using the park, the danger of fire in the forest, and future for the urban forest. This portion of the interview is about Alekxos Sarter’s overview of her education and her career with City of Burnaby Parks, Recreation and Cultural Services beginning in 1986. She tells a delightful story about Prince Charles and Princess Diana at the opening ceremony of the Variety Playground in Central Park. This portion of the interview is about Alekxos Sarter’s first years of employment with Parks, her sources of knowledge about Burnaby Mountain, and the department’s activities in Burnaby Mountain Park. She talks about the loop trail planned for Burnaby Mountain Park in 1958, the Trans Canada Trail project, events and issues at the Pavilion, and keeping track of trails on SFU lands. This portion of the interview is about Alekxos Sarter’s historical overview of early public recreation, and intentions to set aside parkland, on Burnaby Mountain; Acting-Commissioner Richard Bolton’s signing of By Law 1772 that created Barnet Mountain Park in 1942; and her explanation about the function and kinds of park dedications used in Burnaby. This portion of the interview is about Alekxos Sarter’s overview of the history of the Trans Mountain tank farm site on Burnaby Mountain, the delineation of the first conservation area on the mountain in 1974, and the reasons for inclusion of the tank farm in the conservation area. She also talks about Suncor’s site and its inclusion in the conservation area. This portion of the interview is about Alekxos Sarter’s explanation about how lands transferred from SFU to the City of Burnaby are subject to a conservation covenant with the province, what uses are allowed, and how covenant conservation principals are applied to all of Burnaby Mountain Conservation Area with the exception of the Pavilion (Centennial Park) area. Also discussed is the value of the traditional landmark character of Burnaby Mountain and the different meanings given to that phrase. This portion of the interview is about Alekxos Sarter’s views on the pressures on the Burnaby Mountain Conservation Area from the SFU community and utility corridors; managing the edges of the conservation area on Barnet Highway; the history of the Burnaby Mountain Parkway; and a further explanation about kinds of park dedications, the origin of the covenant , and the protection status each provides. Also explained are the terms of the 1995 Memorandum of Understanding between the City of Burnaby and SFU. This portion of the interview is about Alekxos Sarter’s views on the origin and subsequent development and resolution of the dispute between SFU and the City of Burnaby over land ownership and land use on Burnaby Mountain. This portion of the interview is about Dr. Evenden and Dr. Seager’s description of their early years at Simon Fraser University. They talk about the challenges to commuting up and down Burnaby Mountain and the solutions people used, particularly hitchhiking. Dr. Seager talks about living in Montecito in the 1980s. Dr. Evenden talks about the early use of Burnaby Mountain and its undeveloped state when the site for SFU was proposed in 1963. This portion of the interview is about Dr. Evenden and Dr. Seager’s discussion about the relationship between Simon Fraser University and the City of Burnaby, and the origins and development of the dispute over land ownership and control on Burnaby Mountain, and factors that lead to the dispute's resolution. They also talk about the challenges of SFU’s site for access, housing, and establishing a campus community. This portion of the interview is about Dr. Evenden and Dr. Seager’s discussion about the future for parks and the urban forest on Burnaby Mountain.